Plenty more coming in time. Just finding the time to do it all can be troublesome. I'm really wanting to setup a lot of stuff that has been on my bucket list to learn and experiment with since I started at Epic last April. A lot of focus lately has been on the Wiki lighting troubleshooting guide with Eric though. I've got so many destructibles Tips, tricks, and setups I want to do just to help people out with them. That may become a wiki as well. We'll see what happens. This short tutorial will go over the process of creating and exporting LODs with 3Ds Max to UE4. In this example I've chosen to use the statue mesh found in the Mobile Sun Temple demo from the Marketplace. This is my base Mesh showing the shaded model alongside the wireframe mesh. Often times this much details isn't always necessary for a mesh as you move further away from it. There is a lot of detail here that will not be perceptible from further distances. By reducing the polygon count we can create a lower Level of Detail (LOD) version that is not noticeable. In the next steps the mesh will be depreciated for lower LODs that we can use to optimize our games. With UE4's LOD system you can use up to 4 LODs. LOD 0 is our Base mesh with all the awesome detail! LOD 1-3 will be our lower polygon versions. Top is the Wireframe with Bottom being the shaded model. Before starting the first LOD there are two options that are available inside 3Ds Max to depreciate the mesh. There is the option of ProOptimizer and Multires Modifiers. Both are good in their own right and each has it's own method of depreciating the model, but with one exception. ProOptimizer does it in a destructive way compared to MultRes. Here is an example. The mesh in this scene has already had it's UVs completed, but now just needs a lower LOD. ProOptimizer will destroy the UVs in doing so whereas MultiRes will honor them. Make your choice based on your needs as they are similar in how they do the tasks for actually depreciating. Select the mesh you want to use and in the modifier stack add the modifier you've chosen. For this example I've chosen the MultiRes Modifier. This is fairly straight forward for this part. Click Generate at the bottom. This will map the mesh so that the polygon count can be reduced. The options at the top for Vert Percent are now editable. You can also use the Vert Count option if you have stricter limitations or an OCDness that requires even numbers. The next part requires the meshes to be "Grouped" so that they can be used as single LOD. Select all your meshes and center them up to each other. In Max you can select all the meshes and set the XYZ Locations as the World Origin or use the Align tool from the toolbar. The LODs should populate the window in the lower area now. At this point the mesh is ready for export to FBX. When exporting the FBX make sure to remember to check export Animations otherwise your LODs will not work. Once the mesh has been exported to FBX it now just needs to be imported into UE4. Once imported open the mesh in the Mesh Editor. On the right side there will be a listing of all available LODs. To see individual LODs use the drop down to select a LOD. Last edited by Tim Hobson; 04-22-2015, 10:13 AM. Updated Day/Night project for smoother transition to day and night using timeline for the light and skylight intensities. Is that all i need when i want to offer a coop feature for my game (using ThridPerson setup)?? Honestly, not completely sure. I've not messed with multiplayer beyond just getting the single screen multiple players set. Since it's using the same screen I wouldn't think there would be a need for replication since you're not using a server or anything over a network. As far as I'm aware this should be fine for co-op single screen kinds of games. My suggestion would be to setup a simple test level with some events, traps, or other goals and see what you get. Man that is an awesome tutorial on LODs. Little details like that to make games way more optimized. Now if I take my meshes and make them LOD like this, will I have to redo all their placements on the map? Also do LOD's apply to foilage such as rocks/trees? There will be no need to do re-do their placement. If you have your base mesh already placed all you need to do is create the LODs and you can just reimport the original mesh with the newly added LODs or individually import the LODs in the static mesh editor. If you have any trouble feel free to ask. Light functions do not provide color when a light function material is plugged in. This does not mean that you cannot get a colored image by taking advantage of the system though. All that is needed is to setup a material for each color value for Red, Green, and Blue. With the texture sample you'll plug the single color value into the Emissive pin. Also, in the Material Editor the Material Domain will need to be set to Light Function. NOTE: This can probably be done with a single material and using an instance to switch on or off the various color values or some other method. I've just not looked. If I pursue that method at any point I'll update here. You should end up with something like this for the Red, Green, and Blue materials. Scene Setup: These are all Spotlights with an assigned Light Function Material that corresponds to the color value we will assign it. Middle: The three Spotlights with the assigned light functions overlaid onto each other. Bottom: The three Spotlights with their Light Function Material assigned with the light's color value left at default of White. I followed your destruction tutorial with the parking meter. I used the same settings as you. My problem is that if I drive a car into the mesh the car stops/bounces off. I tried changing the impact resistance but it didn't seem to have much of an effect. I want the car to be able to plow through the mesh as it is destroyed. This works if I turn on simulate physics and start awake off. The only problem is that even a small love tap will destroy the object regardless of the impact velocity setting. Custom Impact Resistance is bugged at the moment with 4.7 and previous version. This was fixed recently and will be included in 4.8 once that releases. This is correct that it will do this when impacting. With a low value Custom Impact Resistance this will resolve that issue. Here is a demonstration video with it set. The first is 4.7 and the second part of the video is 4.8 with CIR working. The original purpose of the FBX Chunk post was to demonstrate the mesh switch rather than focusing on impact velocity or other settings. Once the CIR has been publicly released and fixed I'll update the video for a better demonstration. I am happy to hear it is a bug and not something I was doing incorrectly. I look forward to the fix. Thank you. Last edited by Tim Hobson; 04-20-2015, 03:14 PM. 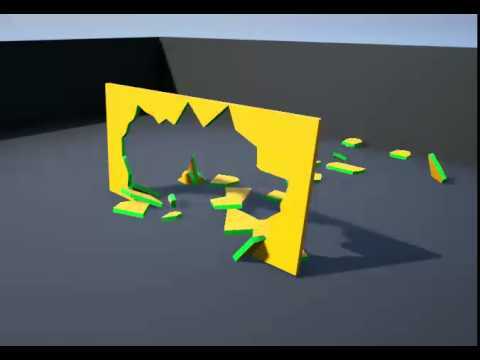 The Flag for Do Not Fracture allows assigned chunks to not be break away from the destructible even if enough force has been applied to do so. This can be useful for making sure parts of the destructible never break or if you want to have a simple hole that can be blown away in a wall for your character to go through. For this part, the settings focused on are Impact Damage and Support Depth. It is not required to use Impact Damage, but can be if you want a impact from any physical objects to impart damage on the destructible. Support Depth on the other hand is required to make this work. In order to assign the chunks we want to NOT be fracture we need to select them with the mouse. Hold CTRL and LMB to select chunk that you want to assign a flag in Chunk Parameters. When selected you will see a blue bounds box around the chunk. Once you have a selected the chunks you want to assign a flag, go to the Chunk Parameters Tab and select Do Not Fracture. That's it! You have now set up a basic wall that can have chunks that cannot be fractured. Last edited by Tim Hobson; 04-20-2015, 04:44 PM. THIS WILL ONLY WORK WITH 4.8 OR LATER. This will cover a basic setup for using Custom Impact Resistance to make a destructible that can provide a low resistance to impact like Glass or one that provides more resistance to an impact, like a Concrete Wall. for the basic setup enable Custom Impact Resistance and set a low value. This can depend on some of the Impact Damage and Damage Spread settings as well, but for a basic example this will get you started. Using High Resistance, the Impact Damage and Damage Spread play bigger roles in the look and feel of your destructible. To find a good starting point for the High resistance, try setting a large value and working your way down to a lower one until you get something that looks OK.
At that point, Adjusting the Impact Damage and the Damage Spread can help refine this even further. Last edited by Tim Hobson; 04-20-2015, 05:21 PM. This will be a demonstration of the concepts put forth in the documentation for FBX Static Mesh Pipeline. 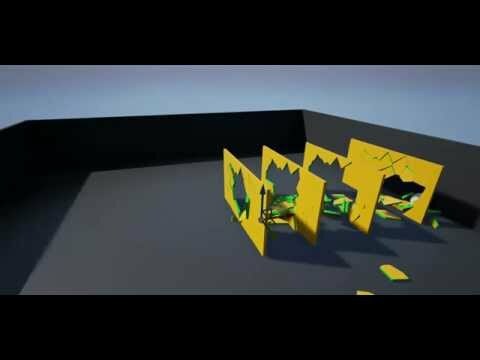 There are three types of custom collision that can be used when creating your own custom collision. A mesh that is too accurate like this will not be considered as a single convex hull. See Step 3 for examples of why this will not work well as a convex hull. When creating your custom collision mesh it is important that the mesh name of the collision mesh match the mesh you’re creating for collision. If you’re going to use more than one collision mesh you will simply need to add numbers to each collision mesh. If you're using a single collision hull, there is no need to use "_XX" after the mesh name. I want to add three collision spheres to my mesh. I create the three spheres and name each one. There are two options here that we need to be aware of when importing custom collision. Auto Generate Collision: If there is no collision hulls detected with your mesh using the prefix UCX, USP, or UBX the editor will generate basic collision on import. If these prefixes are detected this option will be ignored on import. One Convex Hull Per UCX: This option when disabled will import more accurate collision, but it will generate multiple convex hulls rather than a single convex hull. See the example below with this disabled. This can sometimes produce errors with collision hulls that are generated though. In this image you will see that with the option enabled in the import options the collision that is imported does not look like the more accurate collision mesh we have. This is because that would not be able to make a single convex collision hull. Think about this like a barrel with the inside hollowed out. A single convex collision hull would not be able to provide accurate collision for the interior of the mesh. The collision would simply be a cylinder that is around the barrel as a single collision hull. Now that we've disabled the option for one convex hull we can see that our mesh has more accurate collision that represents the original mesh above. This is done by creating multiple collision hulls from the more accurate collision mesh we tried to import. As you can see in this image with some of the collision hulls pulled off to the side we now have multiple hulls that comprise our collision for the mesh. If you look at the indicated of primitives on the top left of the viewport in the Static Mesh Editor you will see that there is a number referencing how many collision hulls were created. This is not necessarily the best option and it's always better to use lower collision primitive counts where possible. Accuracy: This will determine how accurate the collision hulls that are generated are to the mesh. Max Hull Verts: This will determine the number of vertices that should be used for each collision hull that is generated. Auto Convex is getting a good update in 4.8 that will make it much more accurate when generating collision via this method. As you can also see from the number of collision hulls generated, even making out the auto-convex collision settings gives us much less than the 162 by generating our own collision that does not use a single convex hull. The best choice here is to find a balance for what works best for your collision while retaining a more true collision response to your mesh. For objects that need it this would be a good way to get more accurate collision. For objects that don't need accurate collision I would suggest using the box or sphere primitives where needed.